Posted by Duncan in OOW, TW. We’re a shade under a month away from the biggest event in the calendar for those that work in the Oracle marketplace – the Oracle OpenWorld Conference. It runs every year in San Francisco and draws a massive 60,000 attendees from 145 countries (plus 2.1 million online attendees). That’s huge. There are more than 2,500 sessions from ~3,600 speakers, approximately half of which are customers/partners and half are Oracle themselves. As well as the sessions there are the demo grounds and the exhibition hall, all great places for networking with people that you’ve either not met before or have only ever come across online. You get quality face-time with top developers and execs, who are normally hidden behind many levels of Oracle Support. These are the people who have designed and written the products and services that we’ll be using over the coming years, so meeting up with them is priceless. If you register before the event, it’s $2,450 (about £1,600). I’m lucky to have the chance to go again this year, and I know already that it’s going to have huge value for both me and Cedar. Both my colleague, Graham, and I were lucky enough to be selected to speak (his session is on Fluid, mine is on Selective Adoption – the two hottest topics in PeopleSoft right now). This (above) is what we look like, it’d be great to say hello to you if you’re around. Likewise, if you’re coming to either of our sessions let us know and we’ll be sure to say hi. As a nice bonus, we get to see Elton John and Beck at the Appreciation Event! I’m really looking forward to seeing and hearing about the very latest from the PeopleSoft and Fusion/Taleo worlds. Look out for a Cedar event when we return where we can share everything with you. We witnessed a great keynote from Larry this evening. Not only did he have some great announcements, but he was back on form as a presenter. He has ditched the brown suit, the nervous giggles and the ‘next slide’ mannerisms, this year’s Larry is a much more polished and authoritative figure. Oracle already have a SaaS offering (the applications) and a PaaS offering (Java, the database in the cloud etc), now they have an IaaS offering. They are the only vendor who covers all three layers (Amazon only has IaaS, Salesforce only has the other two). Larry sold it well “it’s our OS, our VM, on the fastest, most reliable, most secure systems, running on Exalogic, Exadata, Exalytics and SuperCluster networked together on an Infiniband network’. It’ll be exciting to start using it when it’s available. 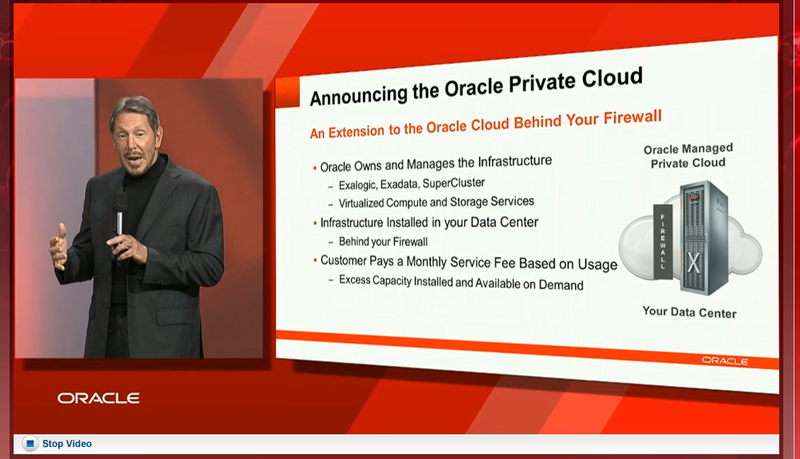 Last year Larry announced the Oracle Public Cloud, this year he unveiled the Private Cloud. This service is designed for customers who are nervous about putting their data in the public cloud (financial or government clients, I would suspect, plus those in countries with strict data governance rules). Essentially, Oracle installs the same servers that it would use for you in the Public Cloud, but in your data centre, within your firewall. Oracle will install, manage, maintain and upgrade the hardware. They’ll also install excess capacity, which you’ll only pay for if you use. The private cloud is capable of running all oracle software, including PeopleSoft – so it’s not a Fusion only service – however it has clearly been designed with Fusion in mind (helping clients who are nervous about the cloud with Fusion-size hardware). Another neat feature is that you can move data back and forth between the public and private clouds (so you could use the public cloud for development, or for backup, or for extra capacity). Larry christened it the 1st multi-tenant database in the world. It was described as a single database comprised of many container databases that you can plug in, each allocated separate memory and processes. Much was made of the fact that other vendors normally implement multi-tenancy in the application layer which is clearly more problematic. He named NetSuite (started in 1998) and Salesforce (1999) as having to run MT in the application layer as back then they didn’t have any other options … which rather amusingly made them sound like outdated legacy ERP vendors and Oracle sound like the bright, new tech. He stated that the plugable database architecture uses 1/6 of the hardware resources and scaled to 250 instances, whereas traditional databases only scaled to 50. 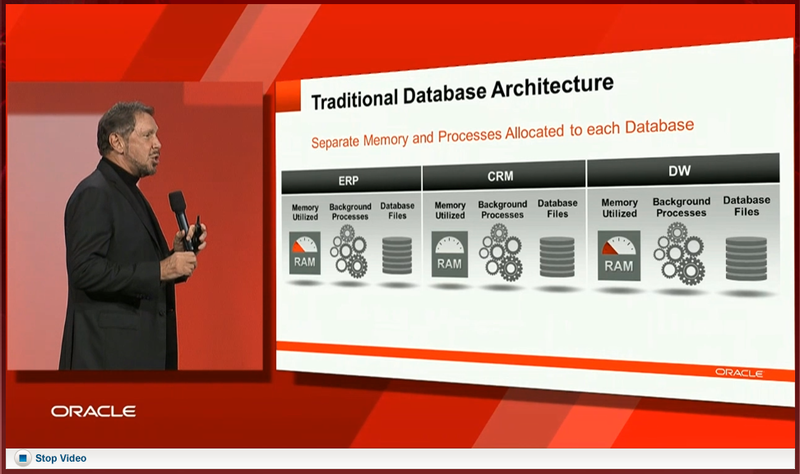 The final announcement was a new piece of hardware – which is apparently the hardware foundation for the Oracle Cloud. It’s essentially a server with an awful lot of memory, enabling you to reside your entire database in RAM. Larry used the phrase “if you thought the old Exadatas were fast, you ain’t seen nothing yet”. A single rack of X3 has 26TB of memory, and as they also compress it, it can store 220TB of data in a single X3 rack (so it’s not just your database in memory, but ALL of your databases in memory). You’ll virtually never use disk drives, although he conceded that they’d still be ok for images etc. In some respects, this is following what some other companies have done, particularly SAP with Hana. 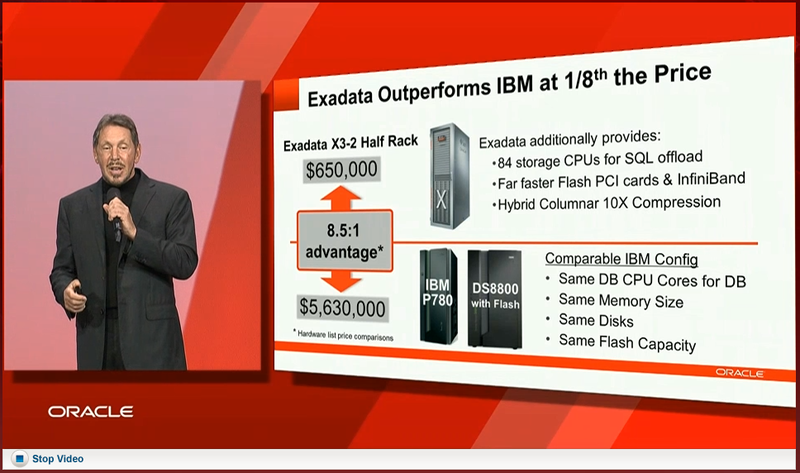 However Hana only has 0.5TB of memory, compared with 26TB in the X3. At a lower level, the 26GB is split between 4TB of DRAM and 22TB of flash memory heuristically managed so the hottest data goes in DRAM. He then compared against an EMC VMAX box (that EMC were recently demonstrating as trouncing the competition), and the X3 comfortably comes out on top. He also did a favourable comparison against IBM. The cheapest configuration is 1/8 of a rack and that lists at $200k, but Larry said that his salesmen would be eager to give you a good deal so you’ll get it much cheaper. Posted by Duncan in Fusion, OOW, PeopleSoft. I had to miss a couple of the sessions that I’d have liked to have seen today as we had to leave early to catch our flights, I was particularly disappointed to miss out on Robert Half International talking about PeopleSoft on Amazon Web Services. I did manage to go and see some of the Oracle UK team (Debi Ashby, Diana Draghici and Mike Everitt) talking about what you can do to improve the PeopleSoft UI. The team walked through some role-playing scenarios for adding navigation collections, portal pagelets etc and then showed some screenshots of the work that Succeed has done at Pret, which was nice. All applications are based on a common unified data model (not split into multiple pillars like PeopleSoft), so you install the database once and you get EVERYTHING, even if you only want one small module! It doesn’t matter if you just want Talent Management, you not only get a database full of every HR module, but all other applications too (Financials, CRM etc). Everything in Fusion is meta-data driven. When you change something, the core isn’t changed, the change is stored at a higher level. The data model is largely based on eBusiness Suite, however it has been enhanced with some of the best bits from PeopleSoft, namely effective dating, Trees and Setids for striping the data. Next up was PeopleTools Search from Matthew Haavisto. I think this is going to be the single best change in Tools 8.52, users are going to love it! In Matthew’s words “It’s more than just a way of finding things, it’s a better way to navigate.” The Search box appears on homepage, plus keyword search on component pages. The most relevant results are shown at the top with facets down the side for additional filtering. In the afternoon I went to PeopleSoft On-Demand with Marc Weintraub. This is an area of real interest to me as I’ve done a lot of PeopleSoft work in the cloud, and it seems like Oracle are starting to flesh out their offerings. Anything that Oracle sells is now available On-Demand, and across their entire suite of products they host 700 customers and 5.5million users on Oracle On-Demand. Next up was Larry’s hotly anticipated keynote. There was a sponsor session first, which was particularly arduous to sit through. I won’t name them here, and I appreciate that they’d spent a lot of money to get such a good billing, but I don’t think much that they said was relevant to the broad interests of those sat waiting for Larry. They’d have been better putting their logo up as a big backdrop and getting a proper professional speaker (Clinton or someone) to talk instead. As for Larry, it was a session of two halves. He started in barn-storming fashion, really sticking it to Marc Benioff and overturning some of the accusations from SalesForce. It was really enjoyable to see one of the world’s foremost CEOs really in a combative mood. He then announced three products, the GA of Fusion, the Oracle Social Network and the Oracle Public Cloud. The energy level tapered off during an overlong demo of the Social Network – but it’s good to see a CEO doing demos (a la Jobs) as many don’t know the products well enough and pass the responsibility to someone else. The final session was PeopleSoft Portal creates a great UI with Southern Company and Matthew Haavisto. This was a showcase for Southern Company’s portal. The UI itself was pretty nice, good use of Lightboxes etc, however the real surprise was the amount of content that they’d included. It had taked a big team to put it in (2.5 consultants for 10 months, plus internal resources) but when they showed the volume of content it’s easy to see where all that effort went. I started off the second day by having another look around the demo grounds. One of the booths had a ‘proof of concept’ demo of how Fusion apps might look on the iPad and it was very impressive. Really slick and gorgeous to look at. I know that there has been a lot of fuss over the Workday iPad functionality, and although I haven’t seen it I fail to see how it could look much better than what was demoed here. My first session of the day was Best Practices for Using PeopleSoft Test Framework by David Howard and Scott Shafer. They asked for a show of hands at the start, and although a lot of people present were on Tools 8.51 not many had used PTF yet. It was an interesting session and I learnt quite a lot, for instance that PTF is the next version of PS Script (for those that have been around a while) and that it works well with the Usage Monitor to narrow down exactly what needs testing. Other things I didn’t know are that there is a debug mode for stepping through the tests, and that you can use variables to make the tests more repeatable. There are apparently bug fixes for this in each of the Tools8.51 patches, and a lot of nice new functionality coming in Tools 8.52. Next up was Creating a great PeopleSoft UI with Jim Marion, Robert Taylor, Matthew Haavisto. This was an interesting one for me as I do enjoy the UI side of PeopleSoft. Much was made of Workcenters, Dashboards and the role based branding in Application Portal and how it makes the task a lot simpler (and more dynamic – different users can have different UIs). Rebranding is normally accomplished by a team of 3 – a graphic artist, a web developer (jQuery and XSL) and a PeopleTools expert. They also showed some eye-candy examples of their handiwork: It seems that the more attractive portions are accomplished by either jQueryUI or XSL (I guess that’s where the Web Developer of the trio comes in). Other tips included not using Query pagelets on the homepage too often as they’re not great for load-time, and use pagelet caching as much as you can (particularly on static HTML based pagelets). They also mentioned that there is a big focus on the UI in upcoming versions, and that some features are going to move from the Applications Portal to PeopleTools. Our flight in on Sunday night was delayed so we missed Larry’s Sunday keynote, although as there was no mention of PeopleSoft (unsurprising) or Fusion (more surprising) this wasn’t as disappointing as it could have been. We started today with a tour of the exhibition area. There’s far too much to take in in one day, but special mention is deserved for the stand that let brave volunteers grapple an actual Sumo wrestler. There’s a large area of demo-pods, where you can walk up and ask specialists either for a quick demo or about an issue that you need help with. I’ve met some of the guys behind PeopleTools (who’ve previously only been names before) and had a great demo of Fusion HCM. It’s really encouraging (for PeopleSoft, at least) to witness the crowds around the PeopleSoft booths compared to other products – it’s noticeably busier. Of the sessions I’ve been to today I started with Shawn Haynes of Cardinal Point talking about Workcenter pages. I’ve not done much 8.51 work – the client I’ve been working on is 8.50 – so a lot of it was new to me. It seems a really powerful concept though, and Shawn is an engaging and knowledgeable speaker. He also gets bonus points for having the courage to go with a live demo – always good to see! I cornered him afterwards for a couple of questions and he seems a thoroughly nice chap too. Next up was William Varma on Performance Monitor. This was a much lower level session, and contained a lot of info, not only on Performance Monitor but also some good intel on pre-loading cache too. After lunch was Humair Ghauri and Daan van Egmond on Fusion HCM: Enterprise grade SaaS. I really enjoyed this session for a number of reasons. Both are excellent speakers, and I can recall Daan from many years ago when he presented on PeopleTools to the UKOUG. What impressed me most was the strength of the Fusion SaaS offering, and the breadth – there is a complete set of options, whether you want on-premise, hybrid or cloud (both single or multi-tenant). You get the advantages of everyone on the same release, regular updates etc without the downside of being on a proprietary platform It’s also very extensible, so you have the ability to tailor (not customise, but tailor!) the application to the client’s needs. I’m hoping to get a look at the tools behind this at a demo pod during the week. Finally I went to Jeff Robbins PeopleTools Roadmap session. Jeff also had a lot of live demos (which was bold considering the number in attendance) and shared a lot about 8.52, upcoming Portal functionality plus glimpses of what’s a little further out. The one question he wasn’t asked, was “where is Tools 8.52?”. I’ll try to add more during the rest of the week. I’ve never been to OpenWorld and I’d love to go. There are so many US based PeopleSoft people that I’d love to meet. I noticed the ‘Suggest a Session’ post on the Oracle Mix blog and thought I’d give it a go. I’d be petrified at the thought of talking to an audience the size that you get over there, but sometimes you have to try these things. 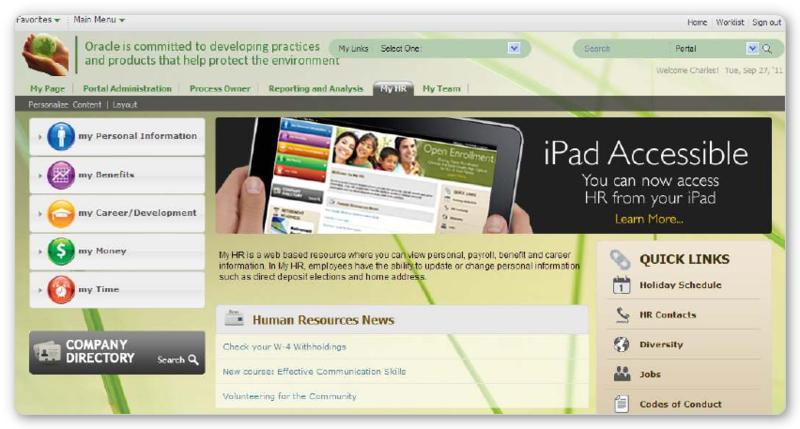 Join me for a Case Study of how a green-field PeopleSoft retail client in the UK used HR9.1 and PeopleTools 8.50 to turbo-charge the user experience of their Employee and Manager Self Service users. This will be a demo intensive session as I walk through the steps to deployment and show how you can deliver a genuinely engaging interface for your employees without needing products from outside the Oracle stable. The retail client is live in the UK and coming to the US soon! Join me for a walk-through of how we used ‘the Cloud’ to dramatically speed-up the PeopleSoft implementation for a greenfield UK retailer. This isn’t another “theoretical cloud talk”, I’ll detail how it worked in practise. It improved our access requirements, reduced infrastructure costs and gave us access to more powerful servers and greater resilience than we’d otherwise have been able to afford. I’ll walk you through the initial decision, explain how everything was set up and demonstrate the benefits delivered to the project. I’ll also describe other occasions where the flexibility of PeopleSoft in the cloud has been invaluable. Click on the headers to go to the voting page (you’ll need to sign-up for Mix if you don’t already have an account). The week’s best bit of news came in Larry Ellison’s keynote today. Larry said that although Fusion will arrive sometime next year, Oracle will keep developing PeopleSoft for a few years yet. A fuller recap of Larry’s keynote can be found here. Graham Smith (Oxfam) gave us an insight into the OpenWorld party, which sounds amazing. There’s a packed post from Brent Martin (ERP Associates) full of Tools info. Apparently there’s a new reporting console to replace Progress Monitor and Report Manager in Tools 8.50, which I didn’t know.